The Irrawaddy River in Burma ranks as the 55th longest river in the world at 2,170km but it is in the top ten rivers in terms of discharge at 13,000 litres per second. The river begins at the confluence of two rivers in Kachin State, the N'mai (Nam Gio) and Mali Rivers, and discharges into the Andaman sea through a vast 10,000-square mile Delta. 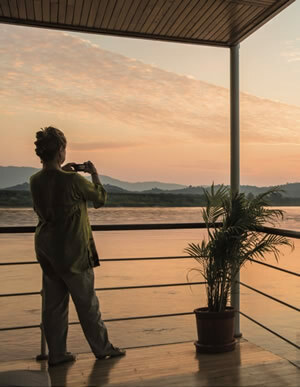 You can experience one of our Irrawaddy river cruises year round, for 1,600km from Rangoon to Bhamo and, for part of the year, for another 200km as far as Myitkina close to the confluence. The main tributary is the Chindwin River. In the monsoon the average rise on the low water level is 30m but in the 1st Defile it is double this. There are three defiles between Mandalay and Myitkyina, the most spectacular of which is the second defile below Bhamo. Between here and the Delta the river varies hugely from mountains to plains. In the defiles the width is only a couple of hundred feet but in the plains it can be miles wide. In the low water season sand islands appear, many farmed on a seasonal basis, and navigation channels become serpentine and often hard to find. Pandaw operates several vessels on the Irrawaddy with services connecting Rangoon to Bhamo.